Dolmaar Riverside Camp is a low cost and value for money campsite which offers various adventure and camping activities. While staying at the camp resident guests also get a chance to admire nature in all its glory from the camp premises. Dolmaar Riverside Camp is located in the middle of lush green hills which have beautiful trekking routes. One can get small 2-3 kms trek to 25 kms trek in the area. Dolmaar Riverside Camp is a dream location for people looking for adventure and peace. 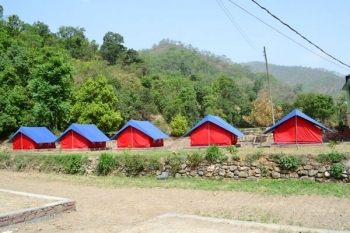 Dolmaar Riverside Camp is located 26 kms from Nainital on Nainital-Kathgodam Highway and on the banks of river Gola. Dolmaar Riverside Camp Resort is 29 kms from Bhimtal, 39 kms from Sattal, 34 kms from Naukuchiatal, 40 kms from Corbett Falls, 60 kms from Corbett, 90 kms from Ranikhet, 90 kms from Almora. The Dolmaar camp have 15 tents pitched in the middle of lush green valley. There is a inhouse kitchen in the resort which offers only Kumaoni buffet meals. - Sattal Trek (8 kms one way): This is a one day trek to beautiful Sattal lake located in the north of Dolmaar Riverside Camp. This is a amazing trekking route in which you cross the small hill river called GOLA. Also the route is full of water streams and panormic views. 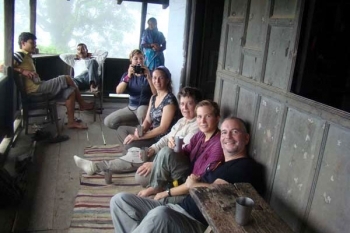 - Markandai Trek (6 kms one way): This trek leads to a small worship place of locals. In this trek you walk closeby from a waterfall (500 meters approx). - Dolmaar Village (4 kms one way): Dolmaar is a small village 4 kms from the resort. Enroute you will have some breathtaking views and scenerey. - Bed tea, Breakfast, Lunch & Dinner (Buffet), One Rock Climbing & rappelling session. - One River crossing session, Raft building and water surfing at river.